Another color that is hot this year is turquoise. It is a fun, versatile color that brides love. Below is a color collage of this great color. One of the reasons I like this color is that you can do so much with it. 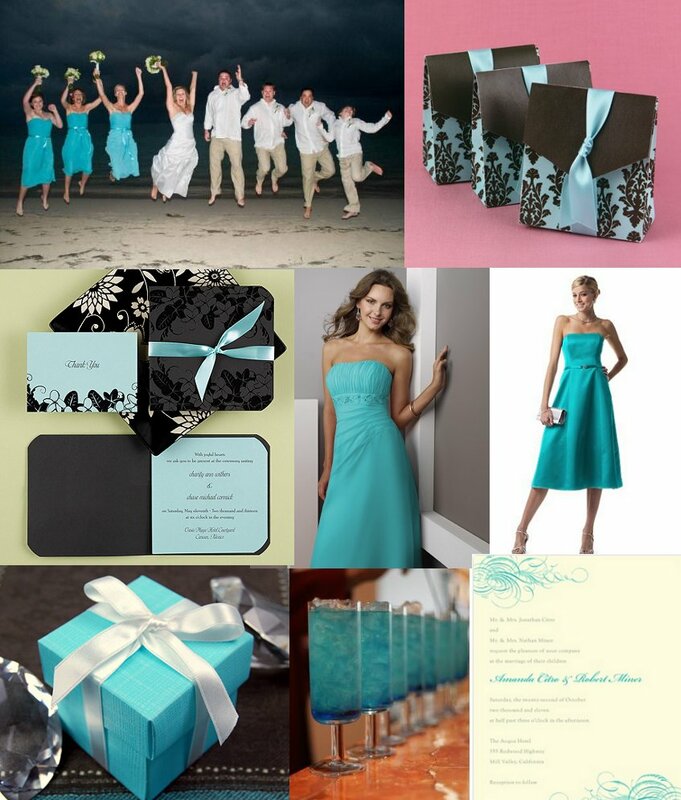 You can have a Tiffany blue and white wedding that will look classic and sophisticated. You could add black or brown as your second color and really play off the beautiful contrast. If you went with brown, you could even have the men in brown tuxes to help make your wedding have a unique twist. Maybe you are having a tropical or beach wedding, well then this color will work for you too. Not all colors can give you a completely different look just by how you apply it. Whether you want a classic, modern, beach or somewhere in the middle wedding you can use this color and it will be beautiful. As I said earlier this week, I was at a conference where I got to see some of the new trends for the 2010 wedding season. One of the color trends is muted or softer colors. I wanted to show you more collages of pictures and decided the first one I would do would be purple (again, I love this color!). My other post (Jewel Colors – Purple) has been popular so I think that you will like this one as well. I think that this could be a beautiful spring or summer wedding. I also think that you could add another popular color grey into the mix (see related Grey Post). It is so fresh and inviting, and I think it would make a great color for your wedding. I am excited that jewel tone color schemes have come back. Deep purple, royal blue and green are back in a fun new way. Brides are using these colors well and combining them with whites, creams, silvers and golds. 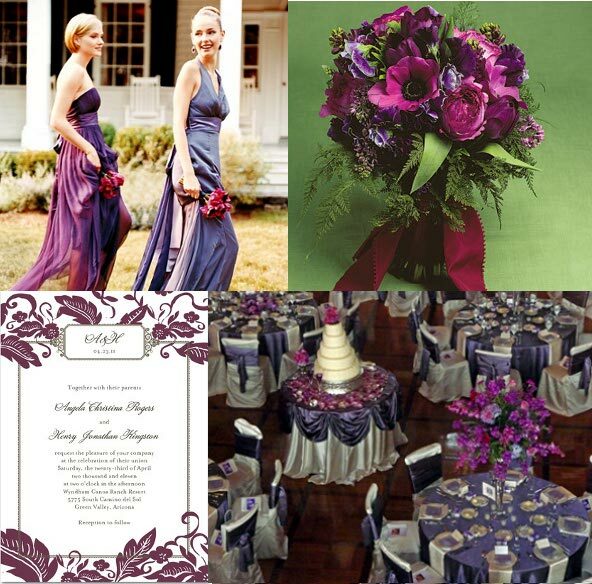 My favorite is the purple tones (maybe because that is what was at my wedding :-)) and have created a collage below to show you this color in all its glory. You can really have fun with this color and have a night to remember. 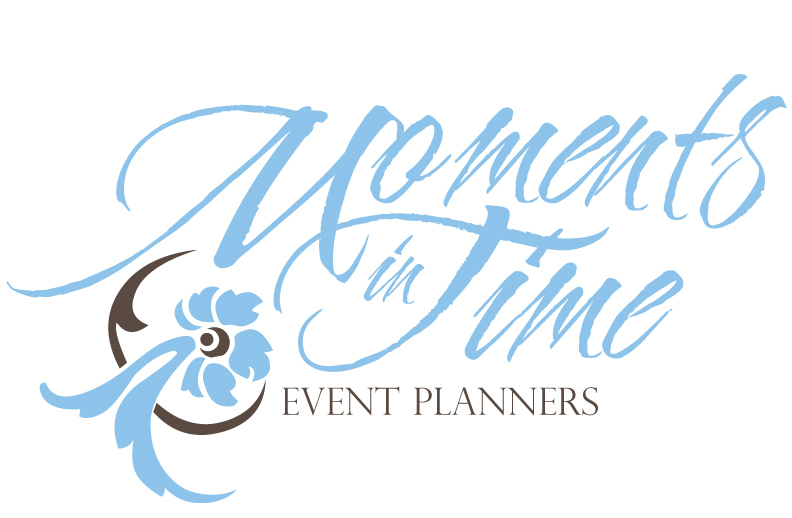 We are excited to unveil our new Moments in Time Event Planners logo. We would like to thank Life of Leo Designs for their great design. They do amazing work! You can go to their website or to their Etsy Store to see examples of their work. The reason I am putting them on this blog is that one of their main focuses is custom wedding stationary. If you want a custom invitation, menu or even monogram, you should definately check them out. I was amazed at how many different ideas they came up with quickly and it gave us the ability to really find our style. We were then allowed to take our favorite design and tweak it to perfect. They do quality work quickly for a good price, what more could a bride want!